KUCHING: Sarawak is turning to the federal government for financial assistance in repairing its road system and other infrastructure which are damaged by floods. Deputy Chief Minister and Minister of Infrastructure Development and Transportation Tan Sri Datuk Amar Dr James Jemut Masing told The Borneo Post yesterday that he was optimistic about the federal government assisting the state as it did for Terengganu, Kelantan and Johor when these states were affected by floods. “I believe the federal government will assist Sarawak in repairing the roads, which have been badly affected by the floods that wreak havoc throughout the state. And not only that, the settlements along the coastal areas are also badly affected, including their (the people’s) livelihood such as their paddy fields. Masing disclosed that the amount needed to repair the roads and other infrastructure damaged by the floods would easily reach a few hundreds of millions ringgit. 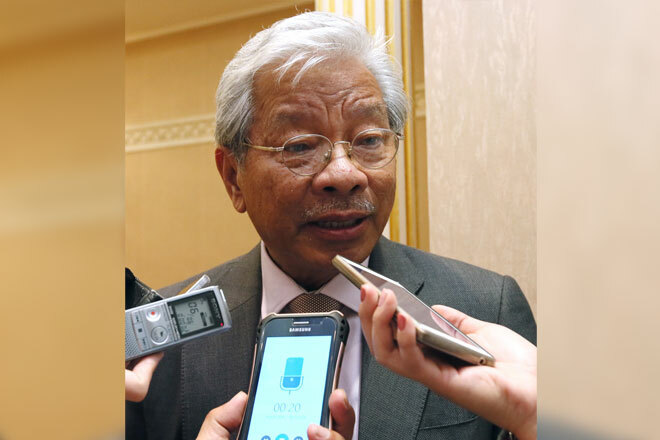 Masing said the current flood situation in Sarawak could be the worst in the past 50 years. “The floods this time are so bad, like they never happened before. In Selangau, for instance, the floodwaters even reached the rooftop of many longhouses. So the damage created by the floods is very extensive,” he said. Masing said his ministry would convene a meeting after the flooding subsides, to assess the damage on the roads and other infrastructure across the state. Masing also said he would brief Prime Minister Datuk Seri Najib Tun Razak on the aftermath of floods, including the impact on the infrastructure in Sarawak today, after Najib officiates at Parti Pesaka Bumiputera Bersatu (PBB) convention at Borneo Convention Centre Kuching.